The filter options allow users to refine a set of call activities in the team summary and employee summary pages. 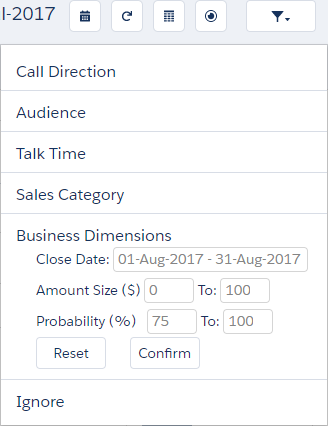 Filter the data available to view outbound calls only, calls of a certain length, sales of a certain pipeline stage or close date, and much more. To start filtering, click near the top of the page. Once you have selected the desired activity or business dimensions, click Update to update and refocus the analytic. To remove a filter, the easiest way is to click x next to it in your list of selected filters. Otherwise, you can open the filter options, go to the appropriate section, and clear the desired check box. After making your changes, update the filter. If you have opened the filter but decide not to make any changes, you can close the menu without affecting your existing filters; just click or Update. Call Direction Select to view inbound calls received, or outbound calls made. Audience If you want to view only calls with people outside your organization, select external only. These are typically calls to customers or prospects, but this category also includes family or friends who are not in the CRM. 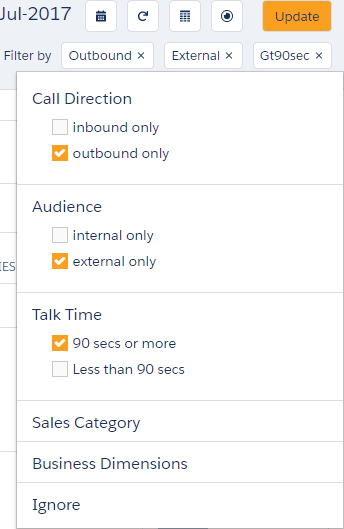 If you want to view only calls with people inside your organization, select internal only. Talk Time This filter exists mainly to remove calls that went to voicemail. Select 90 secs or more to look for conversations that lasted 90 seconds or longer. Select Less than 90 secs to look for conversations that were shorter than 90 seconds, and most likely were voicemails. Displays call activity to people associated with specific context or sales stages in a business cycle. 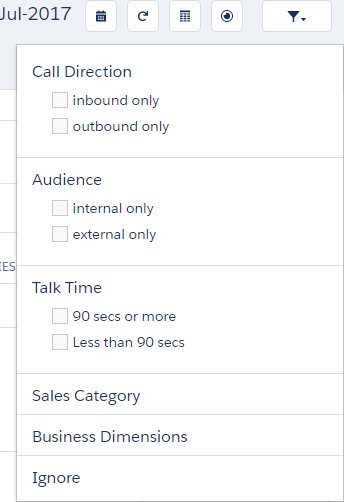 Using the Sales Category filters allows users to specify the business state of the conversation activity. For example, to look at calls to leads, select the Leads check box, and update the filter. Leads A number associated with a lead in Salesforce, which requires this definition to be enabled within the Salesforce app. Contacts and Accounts Without Opportunities A number associated with an existing person (contact) or an entity/organization/company (account). Pre-Forecast Opportunities A number associated with a contact or account that also shows opportunity activity during the period of time of the query. For example, a query looks at all calls from March 1 to March 28; it finds a match between a sales representative and a contact, and that there was a change to the opportunity (such as to the sales pipeline stage or revenue). The analytic assumes the conversation involves the opportunity. If no opportunity activity exists, then this conversation is classified under the Contacts and Accounts category. Internal Numbers associated with fellow employees. Allows users to refine search results based on specific criteria associated with a Salesforce opportunity. For example, do you want to look at calls to opportunities with a certain amount size or close date? Fill in the range as needed. Close Date Select call activity to opportunities that have a specific close date. For example, if you want to look at all calls to deals that close between January 1 and April 15, click the Close Date field to open a calendar. Either manually enter the dates in the FROM and TO fields, or select the starting point of the range on the first calendar and the ending point on the second calendar. Once you have the desired range, click Apply. Amount Size Select call activity to opportunities that have a specific amount size. Enter the numbers only. Do not add a comma or a currency sign; <$4,500> should be written as <4500>. Probability (%) Select call activity to opportunities that have a specific probability. Enter in the numbers only, and do not add a percentage sign. Allows users to refine their search by removing calls that would cloud activity. It can also be used to remove call activity that is likely to cloud the analytic results. 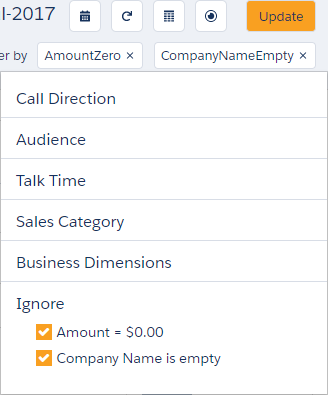 Amount = $0.00 Ignore call activity to opportunities with no associated data in the Amount field. The purpose of this is to focus only on accounts where amounts have been clarified, and ignore all call activity where no amount has been specified. $0 amounts always occur for internal calls and calls labeled as Not Found in Salesforce, as well as for contacts and accounts where no opportunities exist. Typically, $0 amounts also include leads with no associated amount data. Company Name is empty Ignore call activity where the Company Name is unavailable. 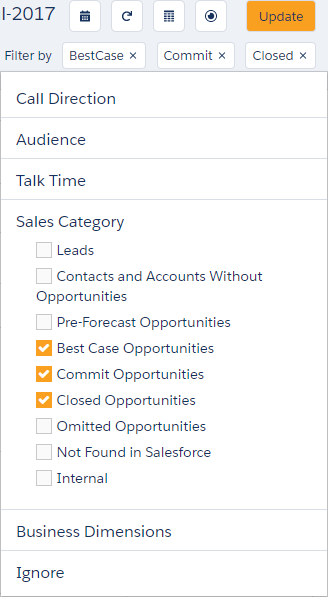 The purpose of this is to only look at call activity linked to more complete records in Salesforce.